Published May 21, 2015 By Anna T. This post may contain affiliate links. Regardless, I only recommend sites I've researched and/or used and trust. When I started blogging about five years ago, I didn't use any special tools for running my blog. All I did back then was log into Blogger (where my site was at the time), start typing, hit the publish button, and I was done until the next post. No worrying over eye-catching images, social media promotion, or really anything else. While part of me does miss those “simpler” times, I'm also grateful for the tools I use now because they've helped me grow my blog. But, times have changed since then. And as my blog has grown, so has the list of blogging tools I use and pretty much depend on. 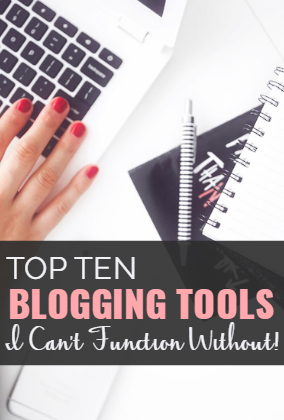 So today I'm sharing my top 10 blogging tools list with you. I know lots of you have your own blogs, so I thought you might want to know what tools I use and recommend, and why I like them. In the past year, I've learned a lot about marketing my blog posts on Pinterest. And as we all know, Pinterest equals images! So if you want to get lots of traffic from there, you need to have some eye-catching images for every blog post you publish. I use a tool called PicMonkey to create my images. It's very easy to use. Basically, you need to find an image that fits the topic of your blog post, upload it to PicMonkey, and then put text over it that will entice people to click through and read more when they see that image on Pinterest. Usually I just put the name of my blog post or some variation of it. Then save it, and insert it into your blog post, then pin it on Pinterest. PicMonkey has a bit of a learning curve, and the more you use it, the better you'll get at making your images. While this is not a free tool, it's not very expensive, and they do offer a free trial. Suzi Whitford of Start a Mom Blog also offers a free e-course on learning to use PicMonkey if you need some help with it. I search for images to use on my blog posts through a site called Pexels. These are all free images that you can use any way you want. I do still pay for stock photos (Dreamstime is a great option for those), but I'm doing this less and less now that I've discovered Pexels. Regardless, I will occasionally pay for an image if I can't find exactly what I need through a search on Pexels. You'll notice that most of the images on Pexels are shaped horizontally rather than vertically. Horizontal is best for Facebook while vertical is best for Pinterest. So if I'm making a Pinterest image, I do crop the photo within PicMonkey to about 280 x 420 so it looks better on Pinterest. For Facebook sharing, I just leave the images as is most of the time. Tailwind is the tool I use to schedule my pins out on Pinterest. I have pins going up on several different boards on Pinterest (mostly group boards I'm part of) pretty much all day long, and it's not because I'm on Pinterest all day. I set Tailwind up telling it what to pin to which boards and at what times, and I'm done. So my Pinterest marketing is pretty much on auto-pilot without me having to do much manual pinning at all. Wondering why group boards matter so much? Because this is how you get your pins in front of lots of people. Even if you just have 100 followers on Pinterest, you can still get lots of traffic to your site if you're on the group boards with lots of followers. Join this Facebook group and search this site to find good group boards to join. Tailwind is about $9.99 a month for the cheapest plan. One downside to PicMonkey is that so many people use it and they only have so many fonts. This leads to a lot of bloggers using the exact same fonts and styles for their images. And it's not that anyone is copying anyone else necessarily — it's just unavoidable because PicMonkey only has so many fonts you can choose from. But, as I mentioned above, they do allow you to use your own fonts that you find on the web. If you download them to your computer, they'll just appear under the “Yours” tab when you're on the fonts section on your next PicMonkey login. Your own, unique fonts can really set your Pinterest images apart from others that just use the same old PicMonkey fonts. So where can you find other fonts? If you want to find unique, free fonts, I'd recommend checking FontSquirrel. If you're willing to pay for premium, high-quality fonts, you'll want to browse Creative Market. I have paid $5 to $10 for fonts from Creative Market that I absolutely love, use all the time, and that aren't being used by everyone else. They have tons to choose from. I am currently using Convert Kit for sending out my newsletters. I have tried a lot of other great services, but this one really fits my needs. It's easy to use with a lot of different options for forms you can use. Plus, they give you the ability to tag your subscribers. This is great because it helps me understand what specific interests my different subscribers have in case I ever want to send a targeted email. For example, if I put a link to something about blogging in an email, I can set it up so the people who click it are tagged as “Interested in blogging.” That way, the next time I have some info that only bloggers or aspiring bloggers care about, I can only send it to those people — reducing my unsubscribe rate. It has a ton of other features as well, another of which is being able to send out different subscriber incentives for people who sign up after reading different posts. For example, people who read a general work from home post will be asked to subscribe and receive my “10 Ways to Work at Home” report. And people who were reading a post about blogging will be asked to subscribe with the promise of receiving my social media strategies for bloggers report if they do so. The price for Convert Kit varies depending on the number of email subscribers you have. The cheapest plan is $29 monthly for up to 1,000 subscribers. Here's a helpful e-course for newbies on learning to use Convert Kit if you go with them for your newsletter service provider (as I recommend doing!). As a blogger, I have to be really concerned with things that slow my site down. Because when you have a slow site, people won't hang around long. I realized recently that one of the things slowing down my site were my social share buttons. I was using Shareaholic and it's not as lightweight as I need something like that to be. So, I went on the hunt for a lightweight social sharing plugin and found Social Warfare. Not only is Social Warfare very lightweight and does not impact my page load speed nearly as much as Shareaholic did, but it also has some cool features. One of the things I love about it is that it allows me to specify the images I want for Facebook and Pinterest. Sometimes when I share posts on either social media network, it just won't pull the right image from my post. So with Social Warfare, I can set it up every time I write a post so that it does pull the correct social media image. Social Warfare isn't a free plugin, but it's also not expensive. You can install it on one WordPress site for only $24 a year, and they promise to refund your money within 60 days if you find it's not working out for you. So far, I love it. Another no-brainer I suppose, but it's a must for me. Google Analytics lets me know how much traffic I'm getting, what posts are popular, what countries my readers come from, and pretty much any other random statistic I'm curious about. It's free of course, and if you don't already have it installed on your blog, you should get it ASAP. If you offer any direct advertising on your blog, you'll find that many potential advertisers will want data and/or screenshots from Google Analytics. While there are other good stat trackers, this is considered to be the most accurate one. I use Google Calendar (free) to help me remember lots of things — including blog-related things! For me, it acts as an editorial calendar as well as a place to put little reminders for different blog-related tasks I need to complete. I like it because it sends me emails to remind me about things I have scheduled and it will also do mobile notifications. And of course I love that it's so easy to access right from my computer. I know some bloggers prefer a physical, paper editorial calendar, but for me that's just not as easy and convenient as Google's free online calendar. Side note — I didn't use an editorial calendar at all until last year, but it has made things so much better for me now that I do use one! There is no more not knowing what to write and spending an hour trying to figure it out. About once a month, I sit down and brainstorm ideas for things to write the next month and just plug them into my Google Calendar on the days I need it to publish. Google has so many awesome free tools you can use for blogging purposes, and this is another one. I primarily use Google Drive for creating spreadsheets. I have spreadsheets created to track my blog earnings, blog posts that are popular and need to be re-shared on social media regularly, and also tax stuff. It keeps me organized and I'd be pretty lost without it. If you have Excel, you can of course use that to make spreadsheets, too, but I don't have Excel and haven't felt like I needed it since I've been using Google Drive. It goes without saying you need to be sharing your blog posts on social media with your followers, but you also need to be sharing other people's posts. Why? Because it's a great way to get friendly with other bloggers, your readers will appreciate ANY useful content (not just your own), and also because any share-worthy posts you send out on your own social media accounts will increase your overall engagement on those networks, and that's a very good thing. So this is why I have Feedly listed. I'm so busy blogging that I don't usually have time to visit other work at home blogs every day and dig around for posts to share. With Feedly, I can add other work at home blogs to my “list,” check it once a day and see what content is new from these other bloggers (along with a number showing how well that post is already doing on social media so I know if it's even share-worthy), and then go ahead and share it or schedule it to be shared later with my own audience. It saves lots of time! So that wraps it up. I didn't intend to write you a 2,000 word post, but it appears I almost did. Feel free to ask any questions about the tools I use, or share some of your own in the comments below. Do you need some blogging guidance? Read my post on starting a blog so you have a good idea of what's going to be necessary if you want to go about this the right way and set yourself up for money-making success. Know that blogging is a six figure income for many people, and for others it easily replaces a full-time job or brings in much needed extra money. Invest in a blogging course. Trust me that this is all SO much easier if you have someone to walk you through the process step by step. I recommend downloading The Secret Blueprint Blueprint For Blogging Success by Ruth Soukup and The Blog Plan – 12 Month Plan For Blogging Success by Suzi Whitford (both completely free!) for more help. This is fantastic, I love this write up. Please how do I get the pinterest eBook? Thanks, glad you enjoyed it! I need to update the post. The Pinterest ebook is not for sale right now because I need to give it an update. I’m not following the exact same strategy that I was. I do have a free eBooklets that I give subscribers, and if you opt in at the bottom of this post, you will get one that tells you what I’m currently doing (as of last week) to get good traffic from both Facebook and Pinterest. At this point in time, that ebooklet is more up to date than the ebook I was selling. What a great list of resources! I use Idpinthat.com for my free Pinterest photos, but I’ll also start trying Pexels. I have not scheduled my pins in advance, but that’s something I’ll start doing now that I want to grow my Pinterest page. We shared this post on 1099Mom. Great resources and excellent post as always! Awesome post! I bookmarked a couple of the sites I especially like the fonts page you suggested.